StreamStats was created by the USGS to provide users with access to an assortment of data and analytical tools. StreamStats provides streamflow and basin characteristics for USGS gaging stations and provides tools to delineate drainage basins, compute basin character­istics, and solve regression equations to estimate streamflow characteristics at ungaged sites. 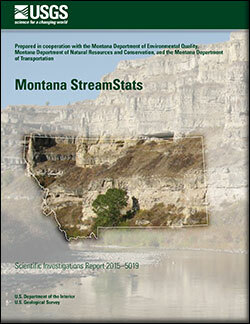 Streamflow characteristics and regional regression equations were developed in Montana and implemented in the StreamStats application. 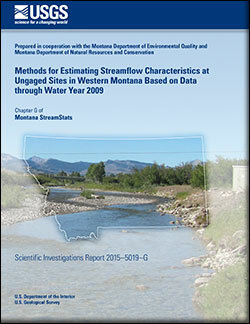 The USGS is working with the Wyoming Water Development Office to develop a StreamStats application for Wyoming, compute streamflow characteristics at gaging stations, and develop regional regression equations to estimate streamflow characteristics at ungaged sites. Work is planned to begin in April 2018, and the project will continue for 4 – 5 years. 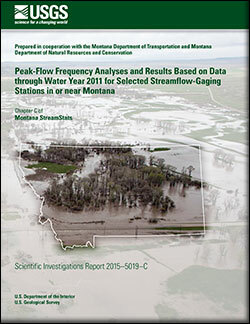 Sando, Steven K.; Sando, Roy; McCarthy, Peter M.; Dutton, DeAnn M.
Sando, S.K., Sando, Roy, McCarthy, P.M., and Dutton, D.M., 2018, Adjusted peak-flow frequency estimates for selected streamflow-gaging stations in or near Montana based on data through water year 2011 (ver. 1.1, February 2018): U.S. Geological Survey Scientific Investigations Report 2015–5019–D, 12 p., https://doi.org/10.3133/sir20155019D. 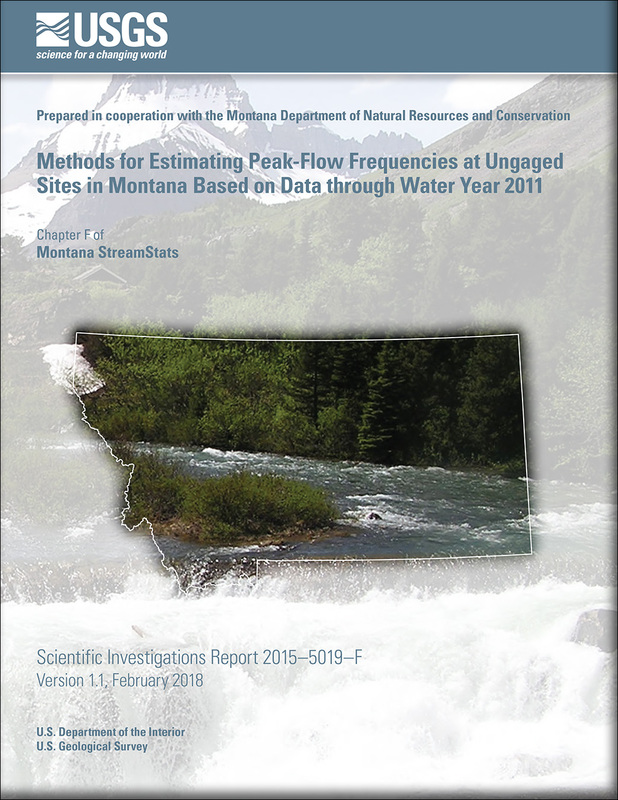 Sando, Roy; Sando, Steven K.; McCarthy, Peter M.; Dutton, DeAnn M.
Sando, Roy, Sando, S.K., McCarthy, P.M., and Dutton, D.M., 2018, Methods for estimating peak-flow frequencies at ungaged sites in Montana based on data through water year 2011 (ver. 1.1, February 2018) : U.S. Geological Survey Scientific Investigations Report 2015–5019–F, 30 p., https://doi.org/10.3133/sir20155019F. 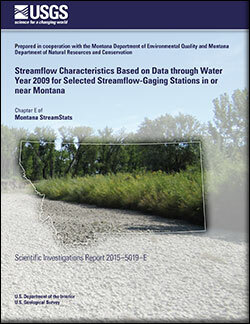 McCarthy, Peter M.; Sando, Roy; Sando, Steven K.; Dutton, DeAnn M.
McCarthy, P.M., Sando, Roy, Sando, S.K., and Dutton, D.M., 2016, Methods for estimating streamflow characteristics at ungaged sites in western Montana based on data through water year 2009: U.S. Geological Survey Scientific Investigations Report 2015–5019–G, 19 p., http://dx.doi.org/10.3133/sir20155019G. 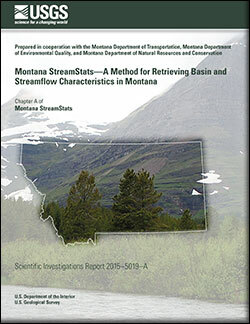 McCarthy, P.M., Dutton, D.M., Sando, S.K., and Sando, Roy, 2016, Montana StreamStats—A method for retrieving basin and streamflow characteristics in Montana: U.S. Geological Survey Scientific Investigations Report 2015– 5019–A, 16 p., http://dx.doi.org/10.3133/sir20155019A. 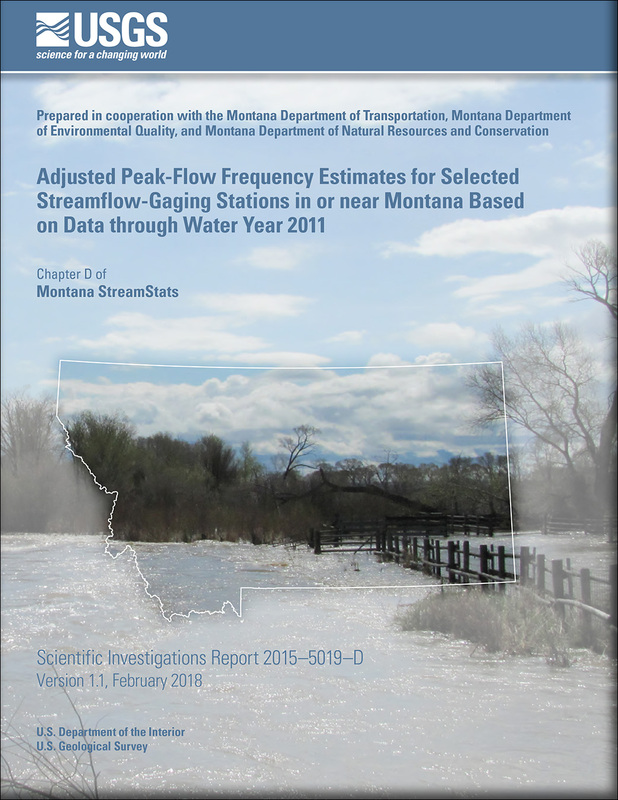 Sando, Steven K.; McCarthy, Peter M.; Dutton, DeAnn M.
Sando, S.K., McCarthy, P.M., and Dutton, D.M., 2016, Peak-flow frequency analyses and results based on data through water year 2011 for selected streamflow-gaging stations in or near Montana: U.S. Geological Survey Scientific Investigations Report 2015–5019–C, 27 p., http://dx.doi.org/10.3133/sir20155019C. 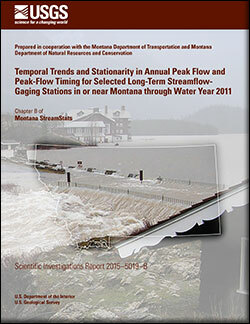 McCarthy, P.M., 2016, Streamflow characteristics based on data through water year 2009 for selected streamflow-gaging stations in or near Montana: U.S. Geological Survey Scientific Investigations Report 2015–5019–E, 10 p., http://dx.doi.org/10.3133/sir20155019E. Sando, Steven K.; McCarthy, Peter M.; Sando, Roy; Dutton, DeAnn M.
Sando, S.K., McCarthy, P.M., Sando, Roy, and Dutton, D.M., 2016, Temporal trends and stationarity in annual peak flow and peak-flow timing for selected long-term streamflow-gaging stations in or near Montana through water year 2011: U.S. Geological Survey Scientific Investigations Report 2015–5019–B, 48 p., http://dx.doi.org/10.3133/sir20155019B. StreamStats is a Web-based geographic information system application that was created by the USGS to provide users with access to an assortment of analytical tools that are useful for water-resource planning and management.